New Jersey Governor Christie Vetoes Two Draconian Bills! October 10, 2015: After Knife Rights shone a very bright spotlight on the absurd and draconian New Jersey Senate Bill 3416, the so-called “Big 5 Bill,” it was significantly amended at yesterday’s New Jersey Senate Budget and Appropriations Committee hearing! The delivery of Knife Rights’ Position Paper detailing the bill’s many flaws just before the start of the hearing resulted in shock and awe and an uproar on the part of the bill’s sponsor and supporters as they were surprised and embarrassed by the revelations, and then frantically worked to amend out some of the bill’s worst provisions. The amended bill passed out of the committee by a vote of 11 to 1 and while it is far from perfect and still would adversely affect some knife owners, it is nonetheless a massive improvement over the original legislation. Hundreds of thousands of owners of knives, antiques, artwork, musical instruments, religious artifacts, firearms and accessories, jewelry, clothing, footwear, furniture, etc. would have become the New Jersey equivalent of felons under the original bill, merely for continuing to possess items legally purchased in the past. Also, orchestras, bands, circuses, and other performers would have no longer been able to legally perform in, or travel through New Jersey. The state’s transportation infrastructure and hubs would have been adversely impacted. The state of New Jersey stood to lose potentially hundreds of millions of dollars in revenue. The amendments removed numerous onerous provisions, including a statewide ban of over 11,000 new species and the criminalization of mere possession or transportation through the state of any items, including knives and sheaths, which incorporated any part of those 11,000+ species (including many varieties of Mother of Pearl, exotic leathers and ivory (the latter already banned from trade in NJ)). All violations were to have been punishable by 3-5 years in jail, a $5-50K fine and loss of civil rights. Many knife owners would have been severely impacted by these provisions. In the end, the amended bill eliminated the ban on possession of ivory and ivory products (as well as rhino horn and rhino horn products). The previously existing New Jersey ban on sale and trade in ivory still applies, but the amended bill no longer makes things even worse. It also pared down the banned species from the original list of over 11,000 to “only” ten (certain species of elephant, rhino, tiger, lion, leopard, cheetah, pangolin, marine turtle and ray, plus the Cape Buffalo). Additionally, the bill’s criminal penalties for failing to procure a “certificate of ownership” for covered wildlife (3-5 years in prison and a $5-50K fine, plus likely confiscation) were replaced with a civil penalty of up to $25 each day a person possesses wildlife without a certificate, collected through a civil, not criminal, action. Even with the certificate, sale and trade would be illegal, and without the certificate, possession would be illegal. At $25/day that can still amount to a horrendous amount of money for failing to register your items. No matter what the state does, many still won’t ever realize that they have to register their possessions and will be subject to potentially ruinous state action against them. As noted, the amended bill unfortunately still retains a useless, outrageous and problematic registration and taxing scheme and still allows only 180 days’ grace period to obtain the “certificate of ownership,” without any actual notice to the public. Any heirs still need to register or be susceptible to the same penalties. It still “takes” all value from these items, making them essentially worthless in New Jersey, since they can no longer be traded or sold. And, there’s still no evidence that any of the bill’s remaining provisions will advance conservation of the named species in any way, and in fact there is evidence to the contrary. Moreover, the radical animal rights organizations who promoted this bill’s introduction still retained many of their most desired provisions, that ironically will actually damage conservation of those species in their native regions. 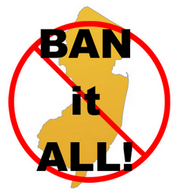 The amended bill is much “less bad” than the original, which represents a very rare and unusual victory in the freedom loathing Garden State, but it nevertheless remains a “bad” bill. Elements of this bill would be problematic for many knife owners, as well as many thousands, perhaps tens of thousands, of other New Jerseyans. For example, many sheaths use elephant and cape buffalo hide, as do many other common items. We still need to research the issue of ray skin, also used on many knife handles and sheaths, to determine its applicability, but that is also potentially problematic. Stay tuned, because this is far from over. In any case, while we have won a battle in New Jersey, the war continues. We still have a fight ahead to stop passage and signing into law of the amended bill because it will still adversely impact many New Jerseyans, including many knife owners and knifemakers, and it sets very bad precedent. We would like to acknowledge our good friend Rob Mitchell from the Elephant Protection Association for his invaluable research and efforts that contributed to the development of the position paper as well as his presentation at the hearing. Together we accomplished what few thought possible, we actually got a legislative body in New Jersey to listen and then react positively to legitimate problems with a piece of legislation. It still has problems, we still need to fight, but with your support we made a difference!